Who are the best players in the Great Lakes region? This is an open thread to discuss All-Region nominations, All-Freshman nominations, coaching awards, and more. Stay positive and keep it civil. Dex Dremann a freshmen for Michigan State who practiced with Boston Dig this past summer is easily the frontrunner for FOTY. As well as one of the top players in region. I would like to talk a bit about Coach of the Year. Even though I am biased I think that the honor should belong to Dan Donovan from Michigan State. MSU has not had the same coach in back to back years for almost the last 10 years. Dan changed this and in his second year as coach has turned the program around. Dan’s focus on mental preperation, along with his vast knowledge and commitment to helping the players has been amazing. Hopefully the Conference championship over Michigan Magnum will turn some heads and get Dan recognition for the excellent coaching he has been doing. I am an ISU player, and will be speaking on the Illinois section. Ill make another post after regionals. Wets, Jeff Zhao, Judah Newman These are the names to know from U-Chicago. Jeff and Judah are both quick gun slinging handlers, who play great defense. Wets, who has emerged as an elite level player over the past two years is the main cutter for this team. He jumps high, runs fast, and makes defenders look ridiculous. Wets should be a no brainer for the All Region team. While I have yet to play against these guys this year, I have played along side all of them and know that these guys are all guys to watch out for. These guys don’t really have any stand out players. They are running a system, and run it pretty effectively. Reid Martin is a freshman on their team, and should definitely make the all freshman team. He is an athletic cutter, who seems to find himself in the handler set pretty often. He skys people, scores a lot of goals, and plays at a high IQ level for a freshman. Their coach is probably the reason for this teams success as he takes forever on each line to get them set up. I don’t know his name, but he should be in the discussion for a coaching award. Also Big Bad Ben Sabourin has pulls that can ruin an offenses chances of scoring without a long point. Again pretty much a system team with a great coach. Yng Ve (Spelling is hard) is probably a huge part of this teams success. Should be in the discussion for coach of the region. As for players, I noticed two players that deserve some recognition. Kyle (Offensive Handler) and Guy with the mask (Sorry I asked someone on the sideline for your name but didn’t understand them) Both of these players are straight up ballers. Kyle is an athletic field general, who basically runs that o-line. He is generally the first cut, and then is an every other kind of player. Great throws, and a great Ultimate IQ. Face Mask guy might be the best athlete in the region. The dude can jump higher than anyone I have ever seen. He is a playmaker on that D-line, and accounts for a lot of the goals that are scored on this team. Jerry Kelly, Michael Armstrong, Wagner. Those are the names to know on NIU. These guys run the team, and were the most underrated team in our section. Without these guys, I don’t think they are in a game to go situation with NUT on Sunday. Here comes the biased part of my post. Jack: Everyone knows this guy and knows he is a beast. he hasn’t played much this year because of a surgery he had in December, but we all know he will get his earned spot on this team. Cal: Sophomore cutter who can play both ways. Has the highest drive on our team to win, and we dont call him mr. 50:50 for nothing. The dude comes down with every jump ball. Cam Powers: Scores. A Lot. Ricky: Defensive Leader on our team who also learned how to play offense this summer. Has been a huge asset on both sides of the disc. comes down with ridiculous catches, and deserves a spot on at least the 2nd team. JoeC26: he doesn’t like attention so I had to throw him in the spotlight. Check out the Florida Warmup catch of the weekend. You will vote for him. ISU Freshman: If all three of these players do not make the all freshman team, then this system is a joke. Alex Jacobson: Our main handler on our O-Line. Kid has next level Ultimate IQ and has shown that he can run a line at such a young age. Had a hammer problem when he got here, but has since found the proper times for hammers. This kid is a beast. Phuoc An Vo:D-Line handler who lays out for everything. While he has caught some slack for his bids, he never goes in for a bid with bad intention. One of the nicest kids on the team, who is a solid handler with great field awareness. He has taken on a leadership role among freshman hosting film sessions, game nights, and just ultimate learning opportunities. He gets d’s and knows how to reflect on his mistakes. Blake Seegers: The only true rookie I have ever seen understand the game of ultimate after 1 practice. This kid has picked up the game faster than anyone I have ever seen. he is a huge defensive presence who we usually put on a top handler. He gets layout d’s plays great offense, and deserves to be mentioned for this honor. I’m the NUT coach, and I’d like to highlight some of the talented guys in our program as well as some of the great players from around the region who may be lesser known. Chris Rozolis - Is an exceptionally skilled defender in his 5th year for us who is among the best athletes in the region. He wears a facemask due to an impact injury earlier in his career, and he has built his game from the ground up, starting on our developmental squad (Bolt) as a rookie. Kyle Rutledge - Is an extremely well-rounded player who practiced with Machine this past summer. NUT traveled around the country and Kyle consistently proved himself against the best players in the nation, on both offense and defense, anywhere on the field. Jeff Holm - Is among the best cutters in the region, and has a level of offensive skill that is very uncommon among taller players. Nathan Graber-Lipperman: With good size and smooth throws, Nate brings a level of offense composure to NUT that is very unusual for a freshman. Micah Thompkins: This St. Louis product had not played ultimate prior to coming to us, but brings his track speed and basketball footwork to the defense. Ben Girard: A product of Evanston Township High School (ETHS), Ben brings NUT his athleticism and his ability to work in big spaces. Raymond Tang: Out of the New Jersey area, Ray is an aggressive defender who breaks the mark well. Jeff Weis - Is a dominant force downfield for them. He’s grown as a player significantly since spending the summer with Chicago Machine, and brings a tireless engine to the field. One of the best cutters in the region. Jeff Zhao and Judah Newman - Two highly skilled throwers with the size and speed to work downfield as well. Jason Vallee - The best player in the illinois section that you’ve never heard of. Excellent defender with great release points. Zubair Abdulla (Coach) - Is the coach who should win CoTR. It’s been said before, but I’ll say it again. He is consistently able to develop great players, he runs an offensive system that is brutally effective, even if you know exactly what they are going to do. Jeremy Burril - An excellent defender who can do it all. A longtime member of beachfront who recently made the Chicago Wildfire. Karl Beck - A skilled thrower excellent at getting open in small spaces. Somehow still underrated. ISU Freshman: The three freshman that Jeremy mentioned are excellent players and immediate contributors for them, all 3 are deserving candidates. Josh Deeman - Great offensive cutter with size, clean footwork, and strong throws. A difficult matchup for any team downfield and a big part of their results this year. Jacob Cuthbert - Good athlete with great field awareness. Strong all-around player for them. Luke Brennan - An excellent athlete and skilled handler. One of the top handlers in the region. Collin Klenke - A very strong handler defender who will drive the line on a turn. A great player and competitor. Connor Buckley and Colin MacGregor - Great athletes with big time playmaking ability. David Hoffman (coach) - One of the best coaches in the region. Has helped bring Nd towards the top of regionals over the past few years. Jake Steslicki - One of the best handlers in the region. Has good size and is dangerous from anywhere on the field. Nathan Shapiro - Another one of the best handlers in the region. Excellent small space athleticism and breakmark throws. Daniel Lee - Big cutter who is great in the air and brings skilled offense as a lefty. Among the best cutters in the region. Tyler Kinley (coach) - Has been recognized over the past few years (rightly so) for helping Michigan be consistently excellent. Eric Badger (coach) - While I do not think he should win, he deserves significant recognition for his efforts in building Boomland over the years and for guiding them to an upset win over Reserve to earn a bid to regionals. As we did not see these teams as much this year, I would defer to people on those teams who know who is most deserving of recognition. Yes I take forever to call lines but the team has multiple players and each one has first and last names and it’s kind of a lot for me to handle so I just try my best. Anyways I’m even worse with names for people from other teams so I’ll only mention the ones I know. Chicago: very top-heavy but they make it work, which is a testament to the heaviness of that top and their coach. Can confirm that the J-people mentioned above are indeed pretty slick. Would vote Zubair for coty; not every system would work for that team, but his definitely does; also he semi-recently defended successfully, so there’s that too. ISU: Shanahan and Cam Powers run the show and have really propped their program up. NUT: Was too busy being disappointed in my team the time they blasted us at Huck Finn so I didn’t catch any of their names. Their top O-line cutter was really roasting us though. John Kulikowski and Walt Jaskowiak: D-line cutters with very stereotypically Polish last names; John runs real fast, and Walt puts on a devastating mark and sets up the D-line while I’m trying to tweet. Jacob Komenda: D-line cutter, the other captain along with Josh. Versatile defender and steady hand on the turn. Reid Martin: rookie who has only played a couple tournaments with A-team. Can play any position (currently O-line handler), getting D’s and resets with aplomb. Doesn’t take no for an answer. Eric Badger: B-team coach who developed everyone in the fall and over the past few years. I would love to talk about a freshman who goes unrecognized from Illinois. That freshman would be Anthony Ruzzo who is a lefty O-line handler. The kid is absolutely nuts. He easily breaks marks and can have big throws when necessary. One reason he goes overlooked is because he does not force throws even if he may have the ability to force such shots as he prefers to run a high efficiency game that leads to success on O-line. While not the most athletic he is much more so than he is given credit for as he often gets open on up lines and plays solid strong D on turns. Everyone prefers the huge hucks and insane D’s which are nice but if you want to talk about how to play winning ultimate look at Anthony’s game. It’s been almost six years now. I’m the Guy with the Mask(Rozo), this was my 5th season, and 4th on NUT and by far the most exciting, fun, and competitive Great Lakes I’ve played in—very excited for this region. I’ll echo a lot of what Kevin Yngve mentioned above and will add some of my own thoughts as well. I’d like to nod to Zubair for COTR, but will be voting Yngve on this one. Puoc An Vo – Smart, athletic, layout monster who is a great handler and great matchup. I was surprised when I found out he’s a rookie. Oliver Hirn – exceptional talent as a sophomore, very consistent and steady player. Jay Valdillez, Max Moore, Matt Niemer – senior class that keeps on elevating their games to a new level. I believe all 3 are more deserving of all-region than I am. They have been anchors this season and fantastic role models for our young players. All 3 are incredibly athletic, skilled in the air, great defenders, and have very consistent throws. I’ll echo Yngve on all 4 of our rookies as well, they work incredibly hard and have all grown exponentially as throwers this season. I started my rookie season on BOLT in 2014 during Kevin’s first year coaching. It was clear then that his mindset fit the team – developmental and process-oriented. Kevin started coaching NUT in 2017 and elevated our program further. He dedicates a significant amount of personal time to film analysis, personal player development, and practice planning. Every practice is focused on learning and growth, and every player has the opportunity to do so in the 2 or 3 hours we have. He brought a new level of conditioning, mentality, and throwing to NUT as well. He challenges every player to throw daily and to complete our biweekly pod workouts – and he’s doing this alongside us. He also knows all of his players on a personal and athletic level. He is cognizant of what is going on in our lives, where our injuries are, and encourages team bonding because the overall goal is fun and development in this program. We have no expectations except that we will perform and play every point in the moment. This team now goes on an annual retreat, organizes dinners, and throws every single day and the culture shift has undoubtedly been guided by Kevin Yngve these past few years. I’d also like to mention that I would have voted for Yngve even if we followed NUT tradition and finished fifth in the region this year. Yngve’s coaching and process-orientation bought me in for my fifth year and I am incredibly humbled to be his student, player, and teammate. Should be a lot of Michigan all-region representation, considering that team was too good to play any consolation games following their quarterfinals loss in the first game Sunday morning. Maybe they wanted to get a head start on the long drive from Ann Arbor to the other side of Ann Arbor. I’m sure Purdue was thrilled to drive four hours each way for a tournament where they only get to play one game on Sunday. Chicago: Judah and Wets. Superb ultimate players and really hold down the fort for UChicago. Both super great dudes too. ISU: Shanahan is a beast. Cam Powers is a beast. I personally hate that guy Jeremy but the man has game and I respect it. Plays with a lot of heart. NIU: Jerry Kelly and Michael Armstrong drive the success of this team. NUT: Congrats on making Natties. I don’t know anybody’s names but Yngve should be in the talks for Coach of the year because he built that program over the last few years which finally culminated in qualifying, so I think he deserves it. Josh Deeman - Other captain and unstoppable O-line cutter. Didn’t get to see him burn defenders at regionals due to an injury at sectionals, but he is very deserving of a nomination. Jacob Cuthbert - Started on D-line this year, but ended up on O-line for his ability to make space, and earn long incuts on some pretty respectable defenders. Also has improved his decision making a ton. Great on defense as well. Kevin Lin - O-line handler who runs the offense. Has throws to reach anywhere on the field and great vision downfield. Ben Sabourin - Plays on both sides of the disc, tough to guard, and plays with a different level of intensity than most. John Kulikowski - D-line cutter and the fastest on the team. Scores many, many points. Reid Martin - Freshman, insane defender. Steady hand with the disc. I would define him as a playmaker. For freshman nominations, I really think all three of our freshman are deserving and would put them up against anybody’s freshman because they would toast them. Reid Martin again: He is deserving of FOTY for the impact he has on the field and off the field. Not too many people rally around a rookie, but when he talks people listen and when he gets in the zone and he makes the people around him better. Anthony Ruzzo: Mentioned on here one other time. A lefty with a huge backhand. Solid decision maker, and always hits the open throws. Was an O-line handler for us because he is so reliable and efficient with the disc. Likes the NY Giants so that is a negative. Asa Bowen: Freshman that was an O-line cutter for us. Never sat back and let the older guys cut and get the disc. Always attacked and is someone who is consistently open and always reliable with the disc in their hands. Will be a force in the coming years. Lastly, shout out Eric Badger Illinois-B coach for developing most of the players on Illinois and leading Illinois-B to a sectional championship and regionals bid. If there were a developmental coach of the year (is there?) he would win for sure. Lowell Knight: Last year he was a secondary D-line handler, this year he was our O-line’s center handler. Good throws, incredibly quick, great defender, very valuable for us all year. Sam Ellison: Didn’t start for us last year, this year he was our O-line’s biggest playmaker. Seems to always get open, great in the air, reliable with the disc. Elliott Eve: Freshman who started the year as an O-line cutter and finished as a D-line handler. Incredibly versatile and smart player. Certainly deserves All-Freshman. I agree with what everyone else has said. Wets is a stud and maybe the best player in the region. Judah Newman, Jeff Zhao and Jason Vallee are also great players. Lots of solid players. Clark Barco is a great O-line handler. Conner Henderson is one of their best players as a freshman. Fantastic all-around team top to bottom. Very well coached. Kyle and Rozo stood out. Another well-coached team that excels in the fundamentals. Beetle is an outstanding player who killed us all 3 times we played them. Klenke and Buckley are great cutters as well. Wish I could say anything, but we didn’t play them this year. I am going to try and be as unbiased as possible. I’m also only going to talk about the teams we played this year. Connor Henderson #14 very athletic playmaker and has huge throws. Was one of their best players this year and only a freshman. Strong FOTY candidate and definitely all freshman team. Kyle Rutledge #12 elite defender and great college thrower. Helped lead them to nationals(congrats). Mask kid: I don’t know your name but you are a freak athlete that we had difficulty guarding. Kevin Yngve: NUT is a real faceless army. A team that works really well together and has great roll players that fit the system. Yngve is a fantastic coach that took control of these great roll players and a year after graduating 14(?) seniors led the team to nationals. Hard to top that COTY resume. Wets: excellent cutter that is the driving force of the team, very good throws and excellent down field. Strong POTY selection. Definitely first team. Judah: crafty handler that is very consistent and very confident. Zubair: excellent coach, better person. Josh deeman: never got to play against him this year cause he hurt his knee at sectionals but he’s good. Trust me. Kevin Lin. Center o line handler for a very good O line. Has an unstoppable flick. We had a very hard time defending against his break throws. Ben Sabourin: d line quarterback. Very athletic big body with huge throws. Reid Martin/Anthony Ruzzo: both freshman that started on the O line with Kevin. Not afraid to take shots and had huge rolls on the team distributing the disc. Both all freshman team in my mind. Michael Wagner: very athletic cutter, was a hard cover for us and consistently burned us deep. Jerry Kelly: extremely talented thrower and distributor that makes plays on D and O.
Michael Armstrong: very fast and consistent player on a very underrated team. Mark whitten: one of the best players in the region. Had awesome throws, awesome skies. Very very talented. Beetle: played every point against us in semis and went every other for all of those points. We didn’t have anyone that could stop him from getting the disc back. His break throws and deep throws made our defenders look silly (you can’t d a perfect throw). Also very athletic and made some big plays on d. Strong POTY candidate. Jake steslicki* and Daniel lee will make the region teams from name recognition. Lost a lot of respect for the team cause they didn’t play their consolation games on Sunday after getting knocked out in quarters. Jack Shanahan: the driving force for his team. Huge throws, huge skies. One of the best offensive and defensive playmakers in the region. Strong POTY candidate. Jeremy Burril: one of the cockiest people I have every met. But he sure does back it up. He is one of the hardest workers on the field and anyone who has guarded him knows how much of a nightmare matchup he is. Extremely quick, huge vert, catches everything. Not to mention he has one of the best flick hucks I’ve seen in college. Freshman who was the center handler on the o line for the Gnomes. He has amazing break throws and has the best hammers I have ever seen. For a freshman to come on to a team and have such a huge impact on their succes speaks volumes to how great of a player they are. Blake Seegers: a true rookie that didn’t play in highschool and was the BEST defender on the Gnomes. It was completely insane how quickly he picked up the game and how big of an impact he had on our d line. It was unfortunate he didn’t get to play at regionals due to injury. We sure could have used him. Illinois state is not fortunate enough to have anyone in the area coach us because no one lives in Normal, Illinois. Jack has taken the responsibility of not only captaining, but coaching a team that has made semis at regionals two years in a row. Previously we, as a program, have never made quarters at regionals before. Jack has literally built this program from nothing and turned it into a team that consistently battles with the top team in the region/country. 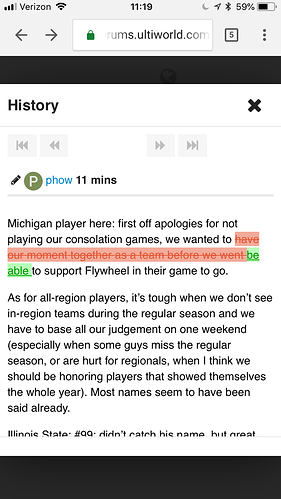 Michigan player here: first off apologies for not playing our consolation games, we wanted to be able to support Flywheel in their game to go. 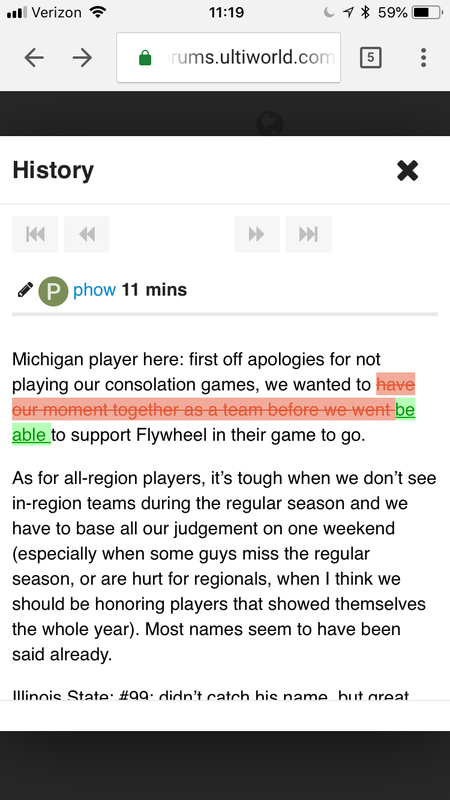 As for all-region players, it’s tough when we don’t see in-region teams during the regular season and we have to base all our judgement on one weekend (especially when some guys miss the regular season, or are hurt for regionals, when I think we should be honoring players that showed themselves the whole year). Most names seem to have been said already. Illinois State: #99: didn’t catch his name, but great defender and good lefty thrower, I thought he was running their D-line and thought he was maybe he was one of their top 3 players, definitely underrated. Chicago: Wets, Judah, Jeff, this is pretty obvious. All 3 are very smart, skilled players. Northwestern: Didn’t get a chance to play them this year, but props to them for winning the region and best of luck at natties. Kyle for sure has been having a great year, Rozo is a great player, and I’m sure any other names that have been mentioned are worthy. Michigan: Daniel Lee, Jake Steslicki are both incredible players and played well against top teams in the country all year. Freshmen for us this year: Jeff Gao stepped up as a handler defender for us, super quick, excited to see what he does in the future. Ashwin Pothukuchi played well as an o-line cutter and tried out for U20 this year. COTY: Zubair Abdulla (UChicago) or Kevin Yngve (NUT). Both are very deserving. No one’s arguing with the notion that you bailed on the consolation games because it was simply what you wanted to do, without consideration of the other teams you’d be affecting, so I guess we’re all in agreement. UChicago - Wets, Judah and Jeff are the ones running this team. All three are very talented with the disc and always a tough cover. Wets will beat you on offfense with his quick feet, and will always be a challenge in the air. Judah and Jeff and high IQ handlers who are very quick and shifty. I believe that Wets should be in the running for Player of the Region. Indiana - #14 on their team was clearly their main guy. Skilled thrower and great athlete. Word on the street he’s a freshman. Probably deserves a spot on the All-Freshman squad. Michigan - Obvious names here are Jake and Daniel, but want to give a shoutout to #4 who is a force to be reckoned with in the air. Another shoutout to #30 who I thought was a solid piece to this team, made good cuts and showed a nice set of throws. Illinois - Kevin Lin is their main guy on O, has killer throws and that can find anyone on the field, very dangerous with the disc in his hands. Ben Sabourin is a key player for this team, great pulls, great throws, and plays both ways for their squad. Shoutout to Drake, he’s an athletic freak who is still very young, he will be a tough cover for any team in the future. Reid Martin and Anthony Ruzzo are two standout freshman for this team. Reid was getting big minutes, late, in close games despite playing majority of the season on their B team. For someone to show up that late and have that much respect from his teammates and coaches, thats impressive. Ruzzo is a lefty with great throws and a very high IQ for a freshman. Both are from the Neuqua pipeline and both are deserving of spots on the Freshman team. Purdue - Didn’t have the opportunity to play them this year, but i’m sure they’ve got some studs on their team. Northwestern - Two main guys that stand out to me are Kyle Rutledge and Guy with the Mask(Rozo). Kyle was a PP for Machine last summer and was a huge part of this Nationals qualifying squad. Kyle is an elite defender with a well rounded offensive game. Rozo is a crazy athlete who will continuously make ridiculous grabs, always a tough person to guard. Kyle was the best player on the best team in the region, should be a front runner for Player of the Region. Also, big shout out Yngve for coaching this team to a Nationals birth. He should be the obvious choice for COTY. Notre Dame - Beetle is the best player on this team, he is avery agile handler who has some hard cuts and incredible hucks. Should definitely be in the talks for Player of the Region. Michigan State - Didn’t get to play them this season. Jeremy Burril - This dude is easily one of the most deserving people to be on the 1st Team All-Region. Jeremy plays with more heart than anyone i’ve ever seen, and is one of the most competitive people I know, who wants to win more than anything, Jeremy is a gritty defender who will straight up outwork you, then let you know that you just got beat. He makes hard saucy cuts and is rarely ever shut down. He is well equipped with a wide variety of throws and has pin point hucks. His hands are some of the most reliable in the game, and he can go up and get it when he needs to. Jeremy’s passion for this sport drives him to try and be the best player on the field at all times, and it’s never surprising to see Jeremy straight up roasting kids. Cal Tornabene - Cal just plays hard all the time. It was said earlier, but we call him Mr. 50/50 because he always comes down with party balls. For being 6’3" Cal is extremely agile and is almost always open on his first cut. He has great accuracy with his throws, and is a very reliable receiver no matter how the disc is coming at him. Cals grind and work ethic makes him very annoying for anyone guarding him or being guarded by him. Ricky Ramirez - Ricky needs to be getting more recognition. Over his 4 years at ISU he has gone from someone who couldn’t catch anything thrown at him, to being voted captain after two years and who will continuously make crazy catches like this. Ricky is an elite defender who will body you and layout D you without any hesitation, and if a disc is in the air, you know he’s going up for that and getting it. He was unfortunately hurting with a knee injury at regionals, but that didn’t stop him from making incredible defensive plays, and coming in clutch in crunch time. The guy could hardly walk, that’s how hard he worked, even through injury. I think he is very deserving of a spot on at least the 2nd Team, he was an integral part in helping ISU become a program that isn’t taken lightly. Joe Cacciatore - He doesn’t like the attention, but this was just an average play for joe. Cam Powers - Cam is a freak athlete. He’s not the tallest guy, but throw a jump ball and i’ve got my money on Cam. His hands are absolutely incredible, and he alway comes down with insane grabs. Cam proved that he can keep up with the best, constantly clowning kids at Florida Warm Up. He was easily one of the most reliable receivers on this team and a huge contributor to this teams success this year. Blake Seegers - Blake was a true rookie who had very little previous experience playing. Although he’s a sophomore, he deserves the recognition. Blake picked up the flow of the game faster than anyone i’ve ever seen. He proved himself to be a great defender early in the season, and continued to grow until he was arguably the best defender on the team. He’s freakishly athletic, with a fast step, great speed, and huge ups. Blake is going to be hard to stop as he becomes more exposed to the game. Alex Jacobson - AJ was one of our higher profile recruits coming into the season (coming from Neuqua) and he definitely lived up to the hype. He was our starting center handler on the O-line, and has some crazy breaks, he can get the disc off anywhere he wants with crazy accuracy. Although he’s small, he is high energy player who is tenacious and sticky on defense. He also brings a high field IQ to every line he’s on, extremely smart for being a freshman AJ should be a front runner for ROTY. Phuoc An-Vo - Phuoc was also one of our top recruits, and he was an HUGE pickup for our D-line, he came in and earned his starting job. He is tenacious defender who is not afraid to layout. He has great pulls and a great set of break throws and hucks. Phuoc is extremely fundamental with the disc and plays a very fast paced but balanced game. Phuoc’s impact on our success this season was monumental. He should definitely be on the Freshman Team.